If you have just purchased a National Cycle® polycarbonate windshield, congratulations! Your National Cycle windshield is the highest quality windshield available and is designed to provide many years of superior performance. We are so confident in the strength and durability of our hardcoated polycarbonate windshields that we will replace your National Cycle Heavy Duty™, SwitchBlade®, Wave®, VStream® or other polycarbonate windshield if it breaks for any reason, other than intentional abuse or chemical damage, for a period of three years from the date of purchase. This policy covers windshield breakage resulting from parking lot falls as well as from an accident. Please read the sticker on your windshield for care and cleaning instructions, or read our page on Caring for Your Windshield. Then go online to register your National Cycle Windshield purchase and your 3-Year Warranty. Now, just for fun, watch our "Polycarbonate vs. Acrylic" video and see why we feel confident that your National Cycle Windshield won't break. National Cycle hereby warrants to the original registered owner of a National Cycle polycarbonate windshield for a period of three years from the date of purchase against breakage. 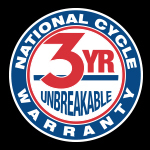 This limited warranty is expressly limited to the replacement of the polycarbonate windscreen of the Heavy Duty™, SwitchBlade®, Wave® and VStream® National Cycle product lines. This limited warranty does not include replacement of hardware, or any consequential damages or expenses including labor cost of installation, inconvenience, inbound freight expenses or damage to any other component of the motorcycle or any other accessories. Certain chemicals, such as petroleum-based and alcohol-based products, are known to cause windshield damage and will not be covered under this limited warranty. Cracks, scratches, and crazing, including those inflicted by windshield alterations, will not be covered under this limited warranty. Please refer to the cleaning instructions supplied with all National Cycle windshields.